Rheumatoid arthritis (RA), also called polyarthritis, is the most common of the various forms of chronic inflammatory rheumatisms grouped under the name “arthritis.” It is an autoimmune disease, a category of diseases where the immune system attacks the body’s own tissues instead of harmful foreign substances. RA leads to inflammation of multiple joints at the same time, causing swelling and pain, and limiting range of movement. The inflammation first affects the synovial membrane that lines the joints. As the membrane becomes inflamed, it loses its protective seal, allowing fluid and blood to seep into the joint, which causes swelling (oedema). Then the inflammation damages other joint components—cartilage, capsule, tendons, ligaments, muscles and bone—ultimately destroying the joint. Often patients with polyarthritis experience flare-ups in between periods when symptoms are milder or temporarily disappear. The disease generally worsens, affecting more and more joints, and eventually becomes incapacitating. It is crucial to relieve the chronic, creeping pain caused by inflammation. Our white pine bark extract standardized to 95% proanthocyanidins, found in all Annedda® products, has well-documented anti-inflammatory effects. It inhibits formation of substances that trigger inflammation in the body: 5-lipoxygenase, phospholipase A2 and cyclooxygenase-2 (COX-2).1 The most prescribed anti-inflammatory drugs in the world focus on inhibiting COX-2. 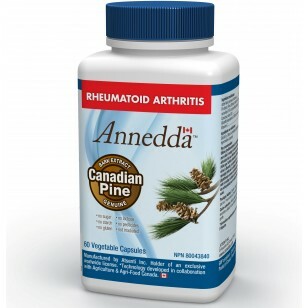 Clinical trials have shown that pine bark extract is effective in alleviating pain associated with osteoarthritis, improves mobility and reduces the need for patients to rely on synthetic anti-inflammatory and conventional pain medication.2 Annedda RHEUMATOID ARTHRITIS® relieves pain as effectively, if not better, than traditional anti-inflammatory drugs without causing the kinds of adverse effects that are increasingly associated with synthetic medications. Some of these anti-inflammatory drugs have even been removed from sale due to these adverse effects (e.g. Viox®), while the use of others is often limited for the same reasons (Celebrex®, ibuprofen, etc). But white pine bark extract is not the only weapon at our disposal. We have also added turmeric to Annedda RHEUMATOID ARTHRITIS®. This spice from India also has remarkable anti-inflammatory properties. Clinical trials have shown that the curcumin in turmeric is more effective than ibuprofen at relieving arthritis pain and improving patients’ ability to climb stairs.3 We have also added black pepper extract because the piperine it contains helps the body absorb more of the anti-inflammatory curcumin.4 The technologies used by major producers of turmeric extract eliminate almost all aromatic constituents (essential oils). This means that the turmeric extracts generally available to consumers are incomplete. We go to great lengths to ensure the essential oil missing from commercial products is added to our product so that you are benefiting from the complete extract. You will notice the difference as soon as you open our product and smell its characteristic aroma. Other than chronic inflammation, there are two factors that cause the deterioration of joint tissues: a vascular disorder of the bone, and an accumulation of glycotoxins (glycation end products) in the body. Joint tissues draw the nutrients they need to develop and repair themselves not from the blood vessels but from the synovial fluid that lubricates the joint. Nutrients are delivered through the capillaries, a network of microvessels that supply blood to the bones. When a dysfunction causes the capillaries to become blocked, they stop nourishing the synovial fluid. This episodic or chronic lack of oxygen and nutrients causes the joint tissues to break down. The proanthocyanidins found in our white pine bark extract protect blood vessels and maintain the normal function of capillaries,5 allowing the body to regain its natural capacity to not only curb deterioration of the joint tissues, but also to regenerate them. The proanthocyanidins in our white pine bark extract counteract these two main causes of joint tissue degeneration7 and allow the body the regain its natural capacity to regenerate healthy tissue. 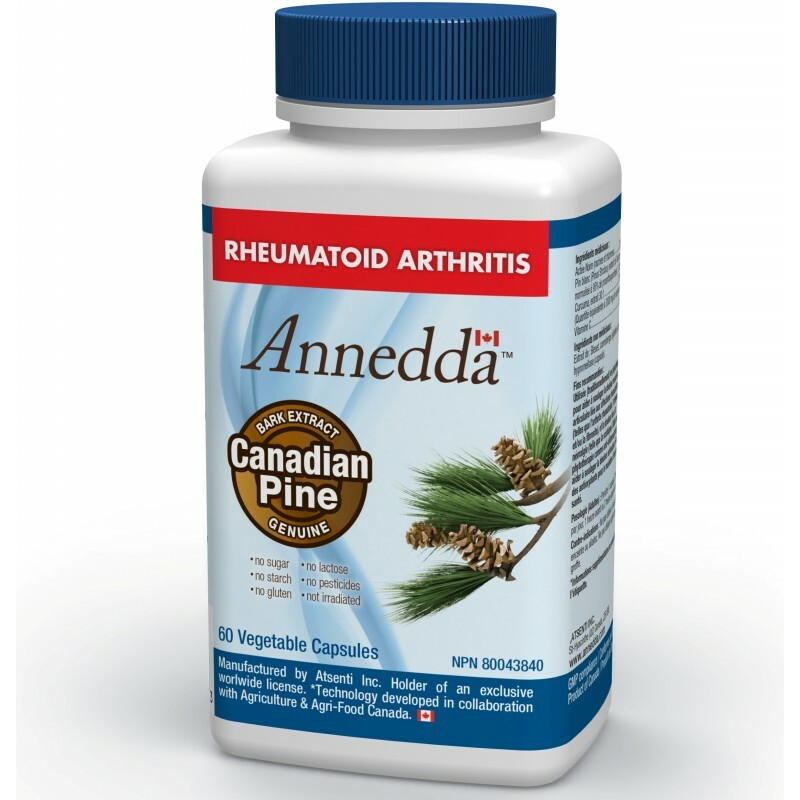 Annedda RHEUMATOID ARTHRITIS® also contains black cohosh to support the reeducation of the immune system. A medicinal plant from North America, it was traditionally used to relieve pain related to rheumatisms. We now know that it works by acting on serotonin, a neurotransmittor that calms anxiety, combats depression and improves mood.9 Since stress is a contributing factor in immune disorders,10 black cohosh can help reeducate the immune system. And by stimulating serotonin production, it will help you overcome the depression and fear of moving you have developed due to the arthritis pain. We have also added vitamin C to the formula for an extra boost of energy. Blueberry extract, cranberry extract, piperine, rosehip extract, hypromellose (vegetable capsule). Take 1 capsule, 2 times daily, 1 hour before or 2 hours after a meal. Consult a health care provider prior to use if: you have gallstones or bile duct obstruction; you suffer from ulcers of the stomach or gastric hyperacidity; you suffer from liver problems or symptoms of liver problems; symptoms persist or worsen; use extends beyond 3 months. Keep out of reach of children. Do not use if the safety seal under the cap is broken or missing. Use for at least 2-3 months in order to gain the maximum benefi t.
You will quickly find that Annedda RHEUMATOID ARTHRITISTM can significantly alleviate pain associated with arthritis, restore flexibility in affected joints and improve your mobility. You will feel an improvement from the first weeks and progress will continue if you keep taking the treatment. If relief is slow in coming, it may be appropriate to supplement your treatment with Annedda ANTI-INFLAMMATIONTM for a few weeks. This contains turmeric, another natural anti-inflammatory that may help to relieve you in the early stages. You can stop taking this product as soon as the treatment begins to take effect and then just continue with Annedda RHEUMATOID ARTHRITISTM. You should also take the opportunity to get outside every day, even in winter, especially when it is sunny. It only takes about 20 minutes of exposure to the sun, even if just the face and hands, for your skin to produce enough vitamin D3 to help fight the progression of arthritis. To support your body as it works to heal, choose your food wisely. Limit your sugar intake and avoid meals high in carbohydrates as well as fried and roasted foods, for they encourage the accumulation of glycotoxins, which cause joint deterioration. Eat plenty of green vegetables (especially dark green ones), colourful berries, nuts (walnuts, hazelnuts, almonds, etc.) and fish because these foods contribute to healthy blood microvessels, which feed the joint tissues. As for cereals (wheat, rice, corn, etc), pulses (beans, peas, lentils, etc.) and other carbohydrates such as root vegetables (potatoes, carrots, turnips, etc. ), limit your intake to about one half-cup portion per meal to avoid raising blood sugar levels, which in turn leads to glycotoxin formation.